I know, I know. I'm a horrible blogger. It's been forever since I've blogged, but I feel like I have a decent reason. It's currently only temporary, but at least I'm out of the house. During my 7 months of unemployment, I came to the realization that I am totally not a stay at home mom. Don't get me wrong. I love my adorable 4 year old mini me, but you see, my husband works from home and let me tell ya, I had way too much family together time. That may sound horrible to some people, but I know there are some peeps out there that totally get me. I baked a lot while I was home and I pinned this recipe a while back, just waiting for the fall to get here so I could make a batch. These donut muffins are really delicious, but let's face it, if you dip anything in melted butter and roll it around in cinnamon sugar, I'm probably going to shovel it in my face. Hmmmm, maybe I need to do that to broccoli. Preheat oven to 350 degrees. Prepare muffin pan either with muffin liners or by greasing the muffin wells. Combine the first four ingredients in a medium mixing bowl. Set aside. Next, in a large mixing bowl, combine the remaining ingredients. Then pour the wet ingredients into the dry ingredients and combine, using as few strokes as possible so as not to overmix the muffin batter (that would result in tough muffins). Bake for about 18-20 minutes. Remove muffins from pan and onto cooling rack. While the muffins are baking, prepare the coating ingredients. Using 2 small dishes, melt the butter in one and in the other dish, mix together the sugar and cinnamon. 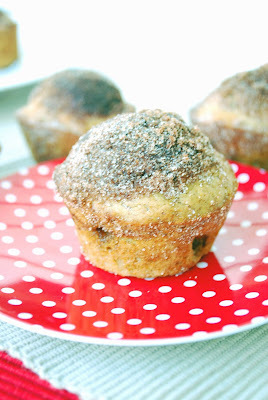 While the muffins are hot (be careful, don't burn yourself), dip the top of each muffin into the melted butter and then into the cinnamon sugar. Place muffin back onto cooling rack and let cool. These are totally wonderful right after dipping. The warm donut muffin with the buttery, sugary, cinnamony coating...mmmm. However, you can keep these in an airtight container for about a day or two. Yum! Totally digging the apple cider. I crave that flavor this time of year. And since it's a muffin, it's like health food, right?! Oh, these look SO DELICIOUS. I don't know when, but I will make these. ps--let me know if that trick works for the broccoli. Congrats on the new job!! And how awesome do these muffins look? YUM!